Summing up his visit to Iran, Ambassador Arman Navasardyan said during the discussions the Iranians wondered that Armenia is discussing the issue of handing over territories. The interest of Iranians is understood. A 100 km section of the border with Iran that used to be controlled by the Caspian Turks is currently under the control of the Armenian army, which is an important circumstance for the security of Iran. Besides, there are no third-party troops in the so-called conflict area, which is also an important circumstance for Iran. It should be noted that it is not only Iranians who are surprised at the discussion on returning territories in Armenia. There is an important circumstance. Outside the country they read such publications and cannot distinguish what motivations such discussions have, who and why does that. They do not care for details, they know that the Armenians are discussing an issue of handing over territories. At the end of the day, it is not interesting. The fact is that the Armenian political and analytical circles have been discussing the issue only from this angle. This is amazing though other explanations are possible. So far this concept has been more or less defined. It can be called Ter-Petrosyan’s concept which is anchored in the ghetto existence philosophy of being aware of the length of one’s own blanket when stretching out legs. Outside this the political and analytical circles have not defined any other concept, approaches which would not be reduced to the primitive situation of the Armenian-Azerbaijani conflict but to deeper problems which are related to the necessity of ensuring vital territories and the need to defend them. The first war in Artsakh broke the centennial Russian-Turkish status quo in the region. Artsakh did not separate from Azerbaijan, Artsakh was never part of Azerbaijan, Azerbaijan is a very small issue compared with the deep situation that formed in the result of war. 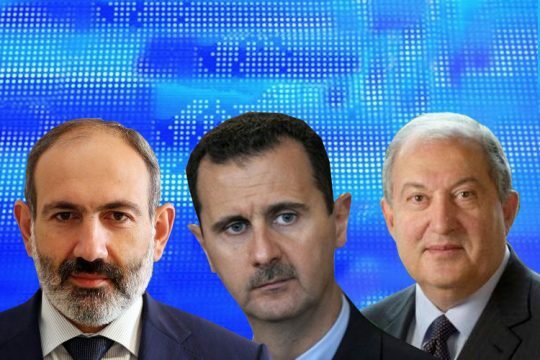 The meaning of the policy of the Russian-Turkish tandem over the post-war twenty years, including that on Syria, is aimed at restoring the old status quo inter alia. The Armenian “discussions” on handing over territories are nothing but service to this Russian-Turkish policy. The noise about the Armenian mission to Syria raised by these circles is in this context. The world, particularly the Russian-Turkish tandem, knows the value and political potential of the Armenian victory in the Artsakh war. Some people are trying to ignore it, others want to turn it back, and this is natural. The problem is whether we realize the power and possibilities of our right.